It is right to have walls in our relationships? What does God’s Word say about building walls? What are walls for? When it comes to relationships there can be so much contradictory advice. Tear down walls, but put up boundaries. If someone has hurt you, you need to protect yourself… but what about love, and “turning the other cheek’? In this episode we hope to give you some new insight and tools to help you navigate your challenging or broken relationships into healing and restoration. Episode 45 offers you a spiritually guided prayer and scriptures to help you fight the battle for your body. Whether you struggle with illness, disease, chronic pain, infertility, body image, there is a word for each struggle of the body. We pray this is a tool you can use to help you on your own journey. Use the scriptures below in your quiet time. Play the episode when you need encouragement and truth spoken over yourself. "Now may the God of peace himself sanctify you completely, and may your whole spirit and soul and body be kept blameless at the coming of our Lord Jesus Christ"
"God is our refuge and strength, a very present help in trouble." Statement: GOD IS WITH ME IN AND THROUGH THIS HARDSHIP WITH MY BODY. HE CARES EVEN THOUGH IT DOESN’T SEEM LIKE IT. HE CHOSE ME FOR THIS TO SHOW HIS GLORY AND TO FURTHER REFINE ME. HE HAS NOT ABANDONED ME. "I consider that our present sufferings are not worth comparing with the glory that will be revealed in us." Statement: FATHER, AS MUCH AS I SO DESIRE THIS PAIN AND SUFFERING TO BE GONE, I KNOW THAT YOUR WAYS ARE ABOVE MINE AND I TRUST THAT THROUGH THIS YOU ARE DOING YOUR WORK IN ME. EVEN AS I ASKED TO BE HEALED I ALSO TRUST AND GIVE UP MY WILL TO DO YOUR WILL IN AND THROUGH ME. I WILL CHOOSE JOY AND HOPE EVEN THOUGH I AM SAD, ANGRY, AND HURT. GOD I POUR OUT MY HEART TO YOU IN THIS LAMENTATION. I GROAN WITH THE HOLY SPIRIT AND COME TO YOU LAYING THIS PAIN (INSERT YOUR STRUGGLE) AT YOUR FEET. FATHER, TO BE HONEST THERE ARE DAYS, OR MOST OF THE TIME THAT I STRUGGLE WITH THIS (INSERT PROBLEM) SO MUCH THAT I LOSE SIGHT OF YOU. I FEEL LIKE YOU DON’T LOVE ME. IT SEEMS SO UNFAIR. WHY ME AND WHY DO OTHERS HAVE IT SO SEEMINGLY EASY? DO YOU LOVE ME FATHER? DO YOU CARE? I FEEL ATTACKED FROM ALL SIDES. I AM TIRED OF FIGHTING. MY PAIN AND SUFERING ARE SO SUFFOCATING AT TIMES THAT I CAN’T EVEN PRAY. YET HERE I AM AGAIN. LISTEN TO MY CRIES. THANK YOU FOR LOVING ME ENOUGH TO LISTEN. TO BE REAL AND RAW WITH YOU. FATHER IN YOUR WORD YOU SAY ASK AND YOU WILL RECEIVE. GOD, I’M ASKING. I’M KNOCKING AND KNOCKING. I’M BANGING DOWN THE DOORS OF HEAVEN. ABBA, I COME AS YOUR LITTLE CHILD AND ASK YOU TO HEAL ME. JUST AS THE PARABLE ABOUT THE WIDOW IN THE BIBLE WHO BEGGED OVER AND OVER AGAIN UNTIL THE JUDGE LISTENED, I WILL KEEP ASKING AND ASKING UNTIL I FEEL YOU SAY NO, DON’T ASK ANYMORE. I ASK IN YOUR NAME AND THROUGH AND IN YOUR BLOOD BY THE POWER OF THE HOLY SPIRIT TO TAKE THIS THING FROM ME (RIGHT HERE AGAIN MENTION YOUR SUFFERING). RESTORE ME AND MAKE ME NEW. I SPEAK AGAINST ANY EVIL SPIRITS THAT HAVE A HOLD ON MY LIFE TO FLEE IN JESUS NAME. I AM ALREADY VICTORIOUS AND I CLAIM THAT VICTORY UPON MY BODY, MIND AND SPIRIT. FATHER, EVEN AS I ASK, EVEN AS I BEG FOR HEALING, I ACCEPT AND EMBRACE THIS AFFLICTION YOU HAVE CHOSEN TO GLORIFY YOURSELF IN AND THROUGH ME. I SUBMIT MY WILL AND FEELINGS TO YOUR PLAN AND PURPOSES FOR MY LIFE AND NOT MY OWN. IF THIS ILLNESS AND STRUGGLE CAN BE USED TO BUILD YOUR KINGDOM, THEN I WILLINGLY AND JOFULLY GIVE OF MYSELF AS A TOOL. I TRUST YOU. EVEN AS I DO MY PART, THE THINGS THAT ARE OUT OF MY CONTROL I ENTRUST TO YOU AND SURRENDER CONTROL. I PRAY FOR PARTNERSHIP IN THIS TOUGH JOURNEY. HELP ME LEARN TO LISTEN TO YOUR VOICE, TO HAVE WISDOM IN EACH AND EVERY DECISION I MAKE IN COMBATTING THIS ILLNESS. SHOW ME AND BE WITH ME AS I LOOK INTO TREATMENTS. LEAD ME TO THE RIGHT DOCTORS, THE RIGHT MEDICINES, THE RIGHT PROTOCOLS TO DO MY PART IN THIS PARTNERSHIP. REVEAL TO ME ANY STEPS I NEED TO TAKE TO DO THINGS, CHANGE THINGS OR RESEARCH THINGS IN HELPING ME BE FREE OF THIS AFFLICTION. I BELIEVE IN YOU TO CLOSE DOORS THAT ARE NOT FOR ME AND TO OPEN DOORS THAT WILL LEAD ME TO HEALING AND HELP. HELP THIS BE A TIME OF PRESSING IN. OF LEARNING HOW TO LISTEN TO YOU. Statement: GOD THINKS I'M BEAUTIFUL, DO I THINK I'M BEAUTIFUL? “God spoke: “Let us make human beings in our image, make them reflecting our nature So God created human beings; he created them godlike, Reflecting God’s nature. He created them male and female." Statement: I AM MADE ME TO REFLECT HIS NATURE. I AM GOD-LIKE. Statement: HOW DO I SEE MYSELF? DO I SEE MYSELF THROUGH A NEGATIVE LENSE, OR THROUGH THE TRUTH OF GOD'S WORD? Lord, I bring you my body I lay it at your feet. Lord, I thank you for these things. I thank you for these challenges and obstacles that I face, knowing that you use them to make me rely on you for strength and identity. I am not where I want to be but I thank you for a body that can move, breathe, and live. I thank you for life. Help me to see myself the way you see me. Help me to see the beauty that you have placed in me even if my outward shell does not make me feel beautiful. I want to feel comfortable in my own skin. Help me to find my worth and satisfaction in you alone and not how I feel in my clothes, the number on the scale, or how I feel when I look in the mirror. Reveal to me if there are changes that I need to make to live a healthier more purposeful life and then I ask for your discipline to put those things into action. I want to honor you with my body. I want my thoughts about my body to honor you as well. Robin is the wife of one and the mother of many. Having raised seven children of her own, she knows just how overwhelming motherhood (and life) can be. Her prayer is that by sharing her own experience, others will be blessed and encouraged to cling to Jesus and serve Him with joy no matter the circumstances. 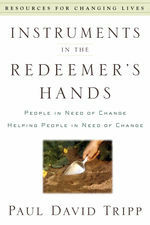 We conclude our review of the book "Instruments in the Redeemer's Hand" by Paul David Tripp. We take you through guided questions to help you identify the things in your life you want to change or improve, as well as give you the tools to help others make changes in their lives as well. We are all ambassadors, representing the Redeemer in the lives of those around us. Learn effective ways to be an instrument of change in your own life and others.